Why the 2009 Hyundai Sonata? Have owned Sonata with I4 engine since 7/2009. 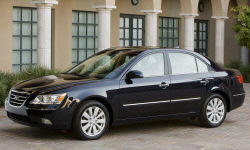 Reason for buying was biggest bang for the buck at the time of purchase and past experiance with Sonata rental cars. Very happy with engine/auto transmission, the V6 would be a waste. Excellent fuel mileage, have been keeping accurate records, overall average since 2010 is 30.8mpg. During 2009 and 2010 was making a lot of 500 mile trips every other weekend. Until early 2010 I was able to obtain non-ethanol unleaded gasoline and was getting 36-38mpg on the interstates and 33.5mpg overall. Ethanol definitely lowers your gas mileage (simple physics). Had one trip to the dealership for warranty work for 2 items at 50K; broken spring on sun visor and defective brake switch causing an "ESC" malfunction. Obviously I'm very very happy with the car which has 66k on it now, and I plan on keeping it till 200k like I do all my vehicles. Why Not the 2009 Hyundai Sonata? Overall the 2009 I4 motor with the 5 speed auto is a perfect match for the car. Plenty of acceleration without being over powered. Gear spacing in the transmission is perfect. Only complaint about the powertrain is Hyundai's choice of downshifting 2 gears while cruise control is enabled. Even on the gentlest of inclines, when the car's speed starts slowing down, the computer downshifts from 5th to 3rd gear and engine RPM's surges from 1800rpm to 3000rpm. Very, very annoying. I communicated my dis-satisfaction to Hyundai corporate headquarters, their response was to take to the dealer to be FIXED. Dealership's response was a little more logical, the cars computer programming is set in stone and isn't going to be changed except for any safety issues. Or lack of quietness. Depending on the road surface, the car can be very very noisy, almost to the point that you might think something has broken, if you have a suddent change of surface. I don't think car has any sound deadening insulation installed, Of course that stuff is heavy and adds a lot of weight to the vehicle which reduces fuel economy.